Happy New Year, to all of you celebrating! I hope that 2011 brings you joy, health, happiness, love, and many delicious moments! I’m still catching up on blogging my favourite holiday food around here, and there is one treat I make every year for the holidays: dark chocolate truffles filled with caramel. And not just any caramel, in my mind this is The Perfect Caramel. I’ve been making this recipe years now for Christmas prezzies and holiday hostess gifts, and the caramel has been successful every time! I owe it all to the fact that this is a “dry caramel”, meaning a caramel made from just sugar being heated in a pan (then you add butter and cream), rather than a “wet caramel” where you heat sugar along with water (which is a 50/50 successful venture for me these days). The other helpful secret? 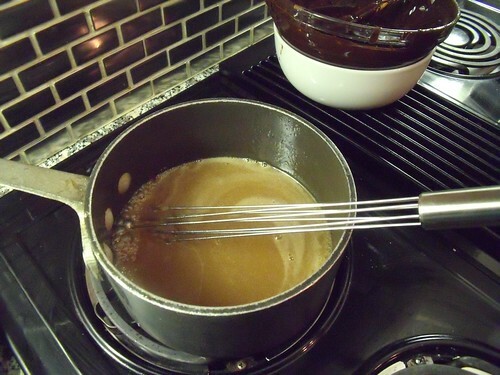 A great recipe at Simply Recipes that gives a step-by-step tutorial on how to make the caramel sauce, with photos at every step along the way. The only “fancy tool” you’ll need to make these are candy moulds that have enough room on the inside for about half a teaspoon to a teaspoon of caramel. And a whisk, but I assume you’ve got one of those. Good chocolate makes a big difference here – it’s worth splurging for these truffles! I promise, they’re easier than you think! 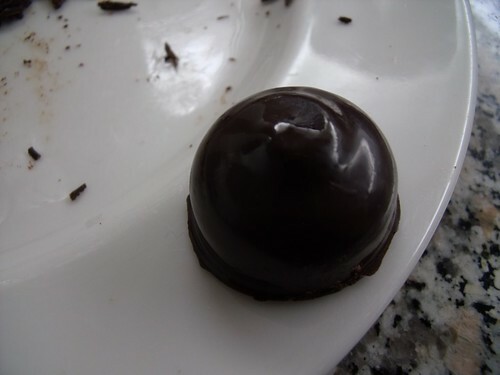 Start by creating the chocolate shells: Improvise a double boiler by putting about 1/2 c. of water in a small pot. Find a glass bowl that sits over the pot without letting any steam escape — if you get steam (water) in your chocolate, you’ll crack the chocolate and it will go to waste. Place the chocolate in the bowl, and melt it over medium-low heat. If you prefer to do this in the microwave, or in a real double boiler, go ahead and use the method you like. 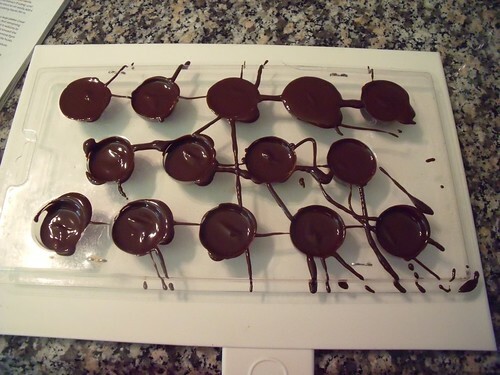 Once the chocolate has melted, pour it into your chocolate moulds to fill them. Then pour out the chocolate back into the pot (you may need to scrape the mould down with a knife or dough scraper). 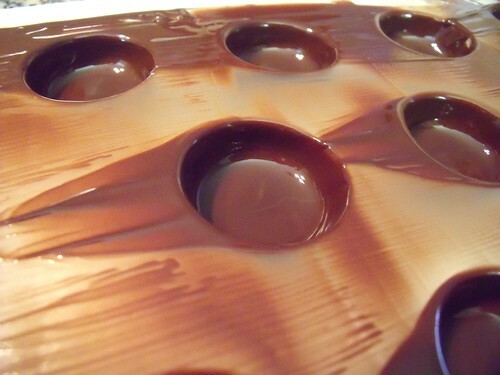 You will get just enough chocolate remaining in the moulds to create the hollow outside chocolate shell. Let this chocolate set by letting it cool completely. You can even do this much the day before. Now create your caramel sauce: Measure out your sugar, butter & cream, and have it all ready to go next to your caramel pot. 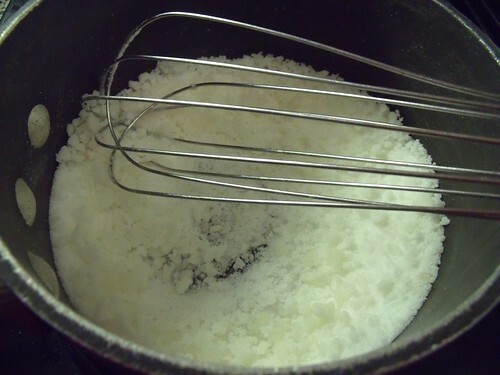 As soon as the sugar has melted to become completely liquid, and an amber colour, add the butter (you will see the mixture foam up quite a bit, this is okay). 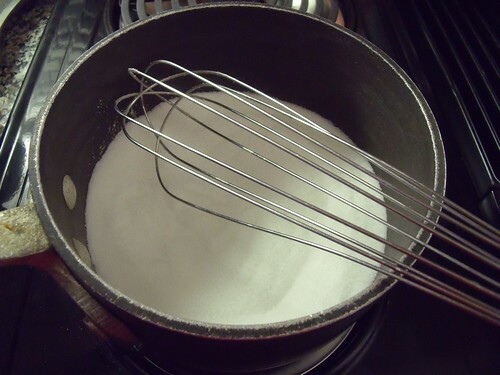 Whisk vigorously until the butter has melted into the sugar. 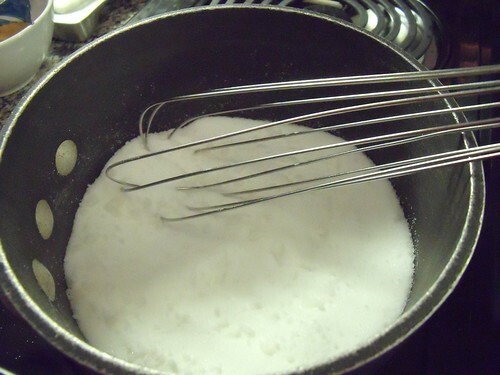 Whisk until the sauce is smooth, and then let it cool to room temperature. 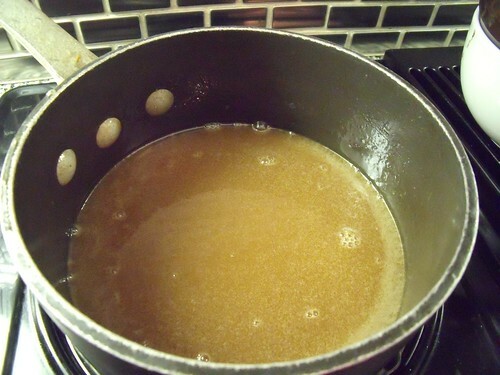 As the caramel cools, it will thicken slightly. You will have more caramel than you need for the truffles — it lasts for about two weeks in the fridge, and you may need to warm it up again to get it back to your desired (slightly thinner) consistency. Using a teaspoon, fill the chocolate shells with caramel. You want to almost-fill each mould, leaving room at the top edge for another layer of melted chocolate to seal the truffles. Let the caramel cool to room temperature. This may take an hour or so. Don’t rush this step, and really wait for it to cool. 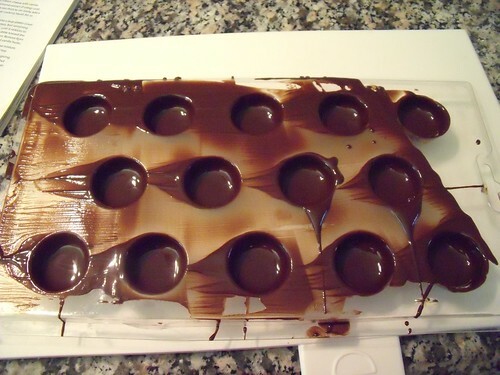 Using the rest of the melted chocolate (you will probably need to rewarm your chocolate to melt it again), cover each shell-filled-with-caramel with a layer of chocolate. 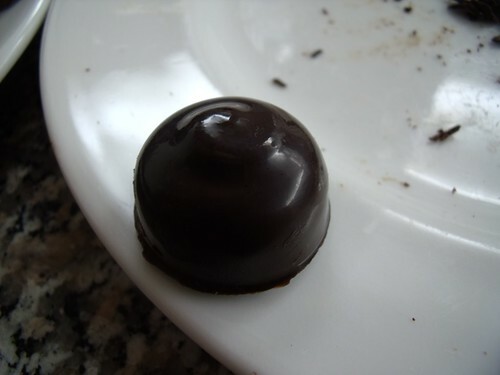 This will create the bottom edge of the truffle when you pop the chocolates out of the moulds. Let sit until entirely cool, then pop out of the moulds and store at room temperature or slightly cooler. I find that putting chocolate in the fridge has unwanted side effects (due to the humidity), so try keep it in a cool non-fridge spot! Give to friends and family, serve alongside desserts, or eat with a lovely cup of coffee. You and I are on the same page about eating more grapevine again… It’s been veggie-time around here, so much so that I feel a little silly catching up blog-wise on all the super indulgent holiday food! Happy New Year!! My phone’s auto spellcheck decided to “help out”! This is an oozy caramel for sure. Enjoy!